Did you really want a new iPad for Christmas? Did you not get a new iPad for Christmas? Shame, if you'd been a good boy / girl, you might have gotten a new iPad instead of a bucket of coal, Mass Effect Andromeda, a second-hand of copy of Rio Ferdinand's autobiography, and some worms. Still, it's not too late to get in on the cheap Apple action thanks to the Boxing Day 2017 sales. Currys PC World is currently selling iPads for £314, if you use the code IPAD25 at checkout. That's a saving of £25 on a new iPad. Doesn't sound like much, but Apple products are rarely discounted, so this is a total bargain. You can grab the 32GB model in all kinds of colours, and still get the money off. Go on, treat yourself! It's better than worms. 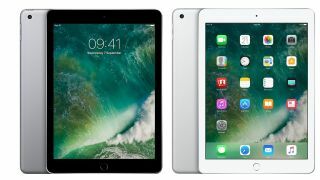 Apple iPad 9.7 with 32GB of storage for £314 - Grab the latest iPad in a variety of colours for £314. Don't forget to enter the code IPAD25 when you check out, or you'll pay too much. Not what you wanted? Well, perhaps you shouldn't have clicked on an article about reduced-price iPads. Anyway, who am I to judge? Perhaps you fancy a cheap PS4 Pro or a fancy Nintendo Switch bundle with Super Mario Odyssey and some other games? Maybe you're just trying to avoid playing Monopoly with your Gran for the third time, because you know she's cheating by stashing all the green properties in her handbag, and you can bring yourself to call her out on it? Either way, there are some cracking Boxing Day bargains to be had so do click through the links above. And if you're still reading this? Have a merry Christmas, yeah?